I was away last week in Istanbul. Nearly six months after my daughter, Clementine, was born, it was time for my wife to return to work. I took her away, while Clementine stayed behind with the dog. Very peaceful indeed, and it was my second week off from writing The Fleet Street Letter this year. The food scene is Istanbul is fabulous. My highlight was the soft cheese with honey, which I could happily live on if stranded on a desert island. Money went a long way once you left the hotel, and there was plenty to see. Sadly, I didn’t manage a trip to the Saudi Embassy which, I am told, has become a tourist attraction. I have been meaning to visit Istanbul for many years, for many reasons, but mainly to see the Bosporus Strait – the split between Europe and Asia. You can see why Turkey is in NATO. Those Russian ships from the Black Sea have no other way home. Strategically important, ever since mankind had its first argument. I highly recommend a visit. But it’s back home to Brexit, China trade deals, the rain, and of course the emerging bear. On that note, I found this chart quite interesting as it shows you a record share of asset classes are down this year compared to previous years. Back to 1900 allegedly! I am sure it’s true. Why not? 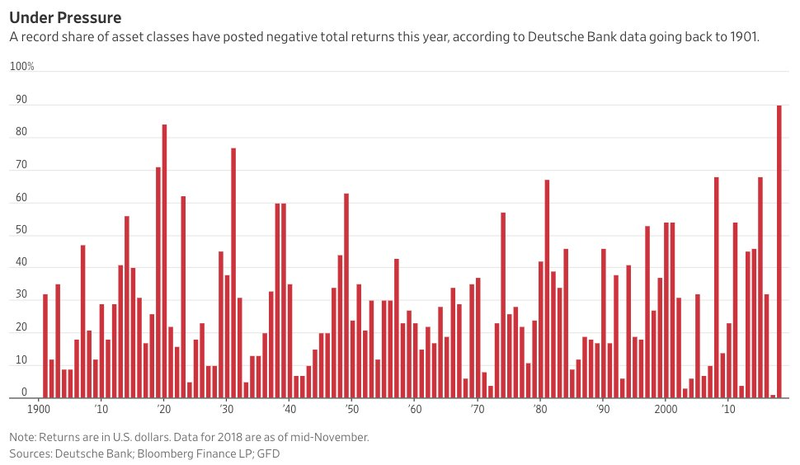 It comes from Deutsche Bank. Maybe it’s just a chart, but something is up. Or should I say, down. But before we become excessively gloomy, I want to elaborate on my last piece and show you the difference between value and growth in the last dotcom bear market – nearly two decades ago, from a slightly different perspective. This chart is capital only, as the dividend data doesn’t go back that far. But the point is well made regardless. Consider that the FTSE 350 Higher Yield Index (HIX) holds the likes of HSBC, Shell and AstraZeneca and that the FTSE 350 Lower Yield Index (LIX) holds Diageo, Unilever and Reckitt Benckiser and so on. Yet two decades ago, the LIX held stocks such as Vodafone (VOD), Hays (HAS) and Sage (SGE). The HIX held many of the stocks you might find in the LIX today. Funny how times change. I know that today’s growth bubble isn’t as racy as it was back then, but there’s still plenty of excess in the system. You can see how dividend payers largely shrugged off the dotcom bear market. That wasn’t true in 2008, but then again, it was a value bubble rather than a growth bubble, driven by inflation-sensitive assets along with emerging markets, financials and so on. My point is simple. That stocks that haven’t had a blast these past few years are well placed to shrug off the bear. Naturally things change, and so we have to be on our guard. But it isn’t necessarily the best strategy to do nothing. To radically raise cash from here, we need more evidence that this will be a depression-bear rather than a recession-bear. There is a balance between holding some dull stocks, some gold and some cash. Doing nothing is fine, but the risk is that you never do anything – ever. So many investors were doubtful in 2003, 2009 and 2016, and they never bought the market. You see it all the time.